Hello friends. 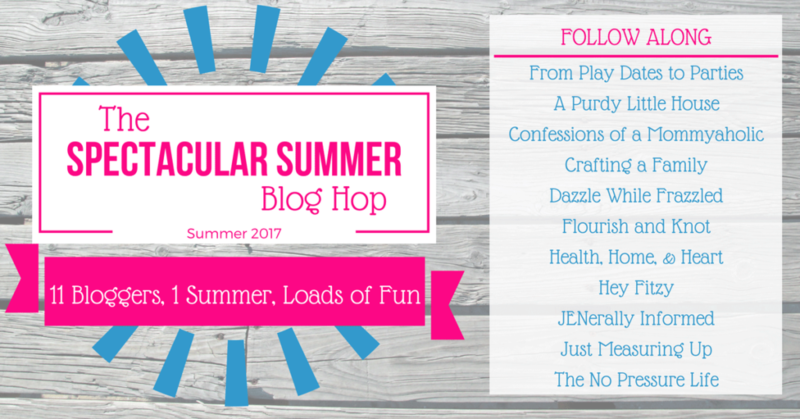 If you are new here and stopping by as part of The Spectacular Summer Blog Hop – Welcome! My name is Tammy and I blog here at Hey Fitzy. With four crazy kids and two wild dogs, my goal is to turn chaos into comfort. Quick and easy recipes are my way of feeding a busy family that always tends to have somewhere else they need to be. There is never a shortage of homework or activities! Until tomorrow that is…finally our first day of summer vacation. If you don’t know this about me yet…I am a label reader. After we discovered our youngest daughter is allergic to dyes, we were forced to read every single label of every single product that entered our home. Not only food labels but also household cleaning products and over the counter medicines. When I say every.single. label I really mean it. After years of reading labels and finding lots of ingredients I couldn’t even pronounce, I started to get creative in finding healthier alternatives for my family. 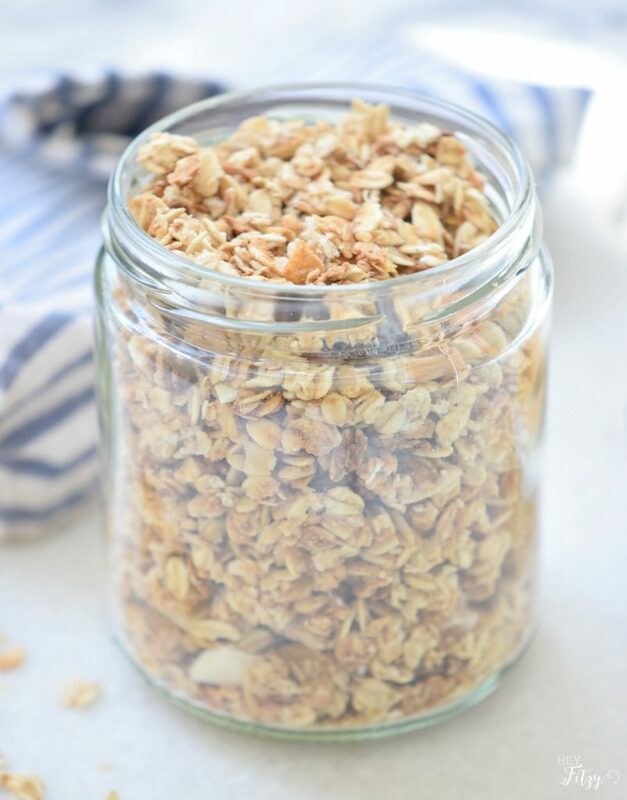 In my search for healthier options I struggled to find a healthy granola that didn’t include extra unwanted ingredients. 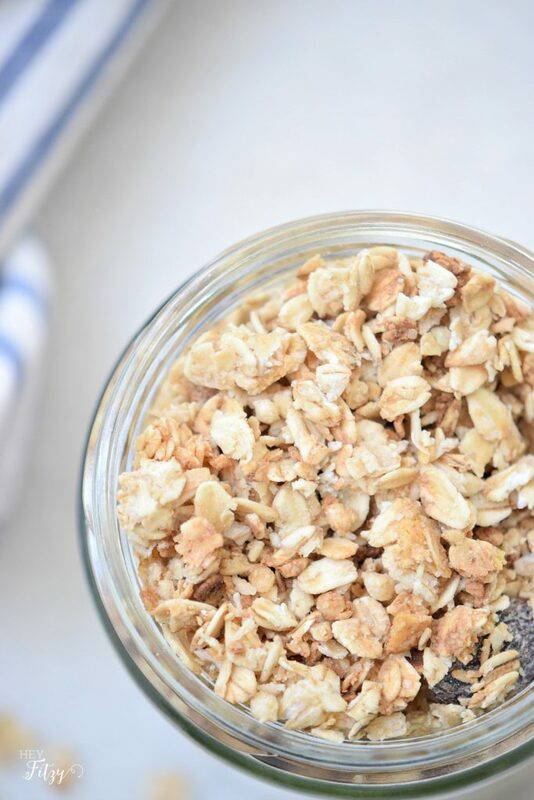 Today I am sharing an easy recipe for crunchy granola that only includes real ingredients I can feel good about. This is a great recipe that can be adjusted according to your preferences. Instead of using prunes, different types of dried fruits and nuts provide a great alternative. This recipe can be made in advance and stored in air tight containers. This is a great way to prep for a busy week and get out the door in time on busy mornings. Preheat oven to 300°F and arrange parchment paper in a baking sheet. In a saucepan over medium heat mix the brown sugar, honey, almond oil, and salt. Stir until well incorporated, then remove from the heat. 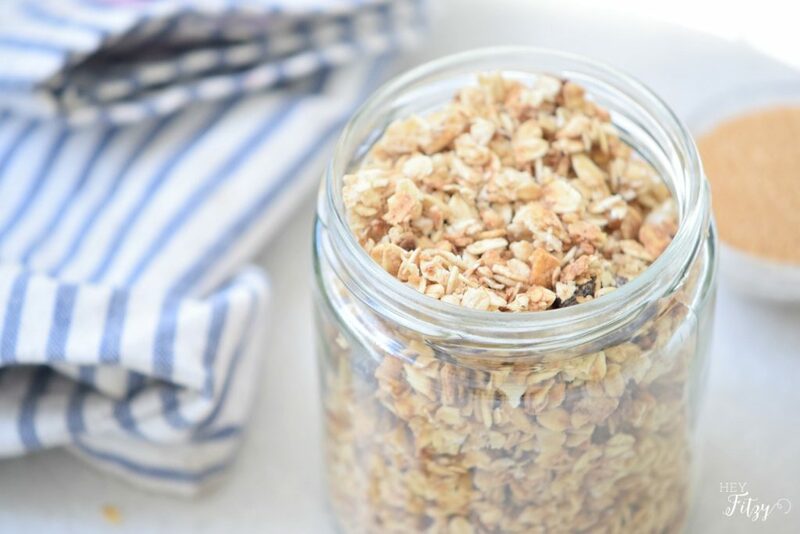 In a large bowl mix the oats, coconut flakes, almonds, and prunes. Coat the dry ingredients with the honey mix. Spread over the baking sheet. Take to the oven for 25 minutes or until golden. Enjoy and save some for later. 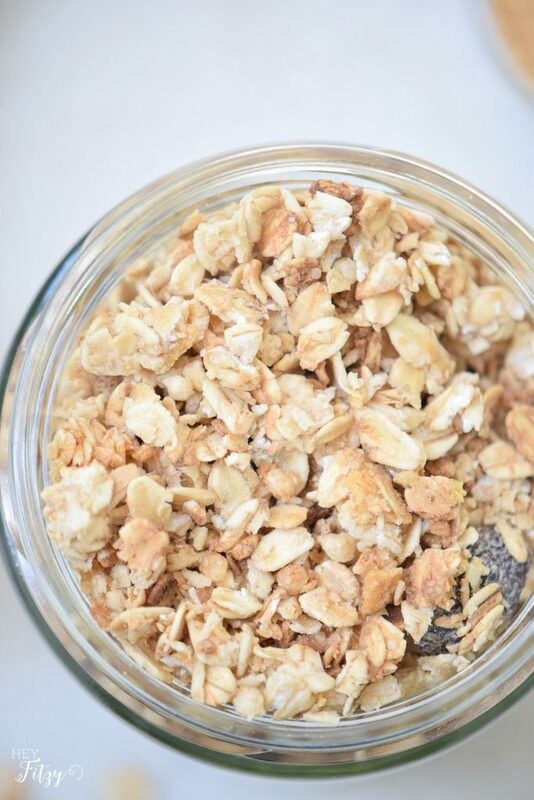 My favorite way to enjoy this granola is mixed with yogurt and fresh berries. How do you battle the constant list of questionable ingredients? Have you found any great recipes that provide a healthier alternative? Hi Jen, It really is easy to make. We like to switch it up with different ingredients each time so it never gets boring. So fun to sprinkle over yogurt or just eat plain. I hope you enjoy it! This recipe is fantastic and I love how flexible the recipe is to accommodate preferences. Pinning. Thank you Sue. It is a fun recipe to switch up the ingredients so it never gets boring. Super yummy with yogurt! Hope you enjoy! Hi Roseann, You are welcome! I hope you enjoy it! Thank you Debbie! 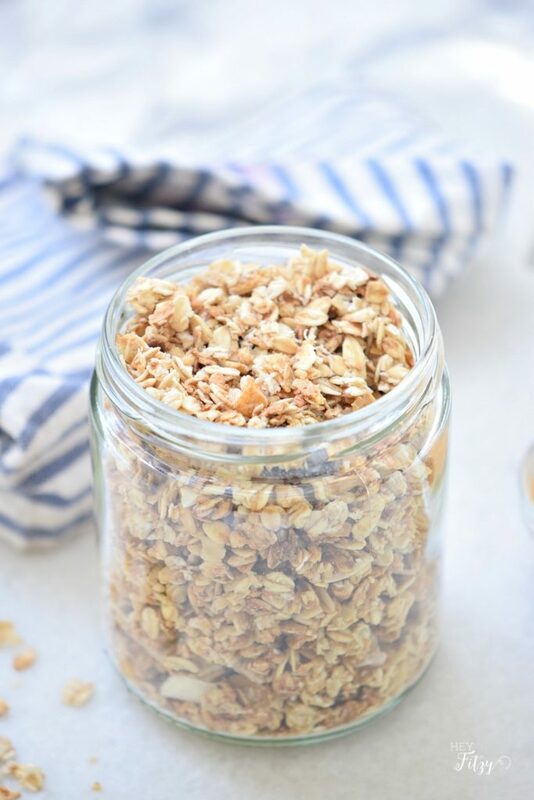 It really is a great recipe that I love to keep on hand for a quick breakfast!